When the North Korean People’s Army (NKPA) crossed the border on June 25, 1950, its large, well-trained army steamrolled through the unprepared ROK forces, starting the Korean War. Believing that remaining neutral would be interpreted as weakness by the Soviets, President Harry Truman won the support of the United Nations (UN) for the defense of South Korea, assigning the military response to General Douglas MacArthur, commander of the American occupation forces in Japan. American reinforcements were sent piecemeal, so the NKPA had gained control of all of Korea except for a small perimeter around the port of Pusan by August. The NKPA had already burned itself out with repeated frontal attacks when an amphibious landing at Inchon caught the North Koreans completely by surprise. Seoul was recaptured on September 25, and the NKPA began to disintegrate. Deciding to reunify Korea by force, an overconfident MacArthur dismissed China’s warning that it would not permit American troops near the Yalu River, the border between China and North Korea. The entry of hundreds of thousands of Chinese ‘volunteers’ into Korea in late November transformed the war. After a series of Chinese offensives and American counter-offensives, the lines had stabilized near the 38th Parallel by mid-summer 1951. Hawkeye Pierce (left) and Duke Forrest (right) watch Frank Burns (center) pray. Recently drafted surgeons Captain Augustus Bedford “Duke” Forrest (Tom Skerritt) and Captain Benjamin Franklin “Hawkeye” Pierce (Donald Sutherland) arrive at the 4077th Mobile Army Surgical Hospital. 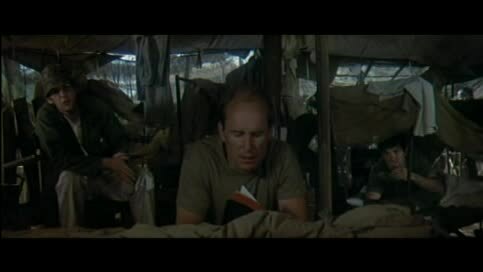 Both men are heavy drinkers, who mock their tent-mate Major Frank Burns (Robert Duvall), a tee-totalling Christian and a poor surgeon who blames his patients’ deaths on junior staff members. When Captain John Francis Xavier “Trapper John” MacIntyre, an excellent thoracic surgeon, is transferred to the unit, he quickly joins the other two doctors in their drunken antics. 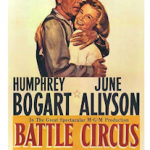 Newly assigned head nurse Major Margaret Houlihan (Sally Kellerman), a regular army officer, tries to introduce military discipline but clashes with the civilian drafted doctors. Houlihan quickly bonds with Burns, and the two have an affair, even though Burns is married. When the other doctors broadcast a sexual encounter between Burns and Houlihan to the camp, the ridicule soon drives Burns into a nervous breakdown. After Brigadier General Charlie Hammond (G. Wood), the commander of the 325th Evac Hospital, suggests that the two units play a friendly game of football with side bets to make it interesting, Hawkeye convinces Lt. Colonel Henry Blake (Roger Bowen), the unit CO, to arrange for Doctor Oliver “Spearchucker” Jones (Fred Williamson), a neurosurgeon and former professional football player, to be transferred to the MASH as a ringer. Unknown to the doctors, Hammond has his own ringers, so the game does not go according to plan. There is little point in examining the movie’s historical accuracy. Director Robert Altman ensured that there were no references to the Korean War because he wanted viewers to think of the then-current Vietnam War. 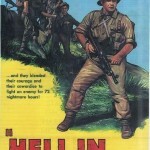 The studio disagreed, so the quote “I will go to Korea” from Dwight Eisenhower’s presidential campaign was placed at the beginning of the film to remind people that it was a Korean War film. Announcements on the camp public address system also refer specifically to the Korean War, but they were added during the post-production process. 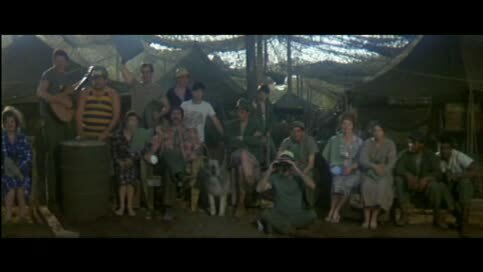 Even though it was filmed at the Twentieth-Century Fox ranch, the MASH unit looks authentic, clearly they had a decent budget. It never seems to move, which makes sense since it takes place after the war had entered the stalemate phase. However, it does not matter, since Altman had no interest in the Korean War, and simply used it to mask his criticism of the Vietnam War. Ring Lardner, Jr., who wrote the screenplay, came across the novel when a publisher asked him to read it before publication and write a blurb. Impressed with the novel, he recommended it to Ingo Preminger, brother of director Otto Preminger, who had recently decided to become a producer. Twentieth Century Fox agreed to finance the film, but their original suggestion of Walter Matthau and Jack Lemmon as the lead actors was diplomatically turned down. However, none of the directors they approached would agree to make the film, even though they all loved the script. The directors were worried because of the unconventional nature of the story structure, which was a series of vignettes. When Robert Altman’s agent gave him the script, he jumped at the chance to do it. A successful director of television programs who was trying with little success to switch to movies, he was hired because no one else would do it and he was cheap. Recognizing the black humor of the novel, Altman ensured that the movie was filmed in an anti-glamorous style that was the opposite of the usual Hollywood approach. Since the studio, especially production head Richard Zanuck, was busy dealing with the blockbusters Tora, Tora, Tora! 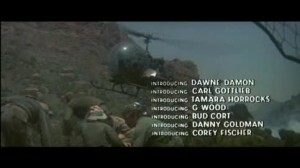 (1970), Patton (1970) and Hello, Dolly! 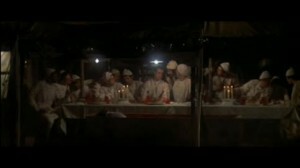 (1969), Altman received little supervision. The rejection of traditional Hollywood glamour applied to the cast as well. Even the three leads are listed as co-starring in the credits, and half of the cast are introduced, since it was their first picture. However, Elliot Gould and Donald Sutherland had gotten accustomed to being treated like movie stars, and they disliked Altman’s democratic approach where everyone was allowed to make comments when the rushes were screened each night. Believing that they had too much freedom, the two stars quickly became fed up with Altman’s inability to actually tell them what he wanted. MASH may have been radical at the time but it does not hold up well today. All of the authority figures are blustering hypocrites, aside from Blake, the commander of the MASH, who is not really an authority figure because he lets everyone else run the camp. The three doctors, Hawkeye, Trapper John and Duke, understandably resent being drafted, and although they are professionals in the operating room, their extra-curricular antics become increasingly offensive. I realize that the script intended to show that the doctors went crazy under the pressure of an endless stream of futile casualties, but all three doctors were already determined hell-raisers when they arrive at the MASH, instead of being warped by their experiences. The film may have rebelled against authority but it was still a product of its time. Captain Walter “Painless” Waldowski (John Schuck), the unit’s dentist, suddenly has trouble getting it up, so he thinks he is gay, so naturally he has to kill himself. Clearly modelled on Leonardo DaVinci’s mural painting of Jesus Christ’s final dinner with his twelve disciples, a farewell supper is held for Painless, who thinks he is about to commit suicide, unaware that Hawkeye has a different plan. Honestly, I hardly laughed at all during the movie, although the Last Supper scene was well-staged, and tugged a little on the heartstrings. One of the few impressive parts of the movie are the surprisingly graphic scenes in the operating room. Seriously, the wounds are astonishingly graphic, one soldier’s throat is squirting blood. There are many operating scenes, and they are the best part of the movie. Furthermore, the use of the announcements on the camp public address system to give background and a sense of the passage of time is really good. The content for the announcements came from Twentieth-Century Fox publicity archives and Korean War-era almanacs. However, the most objectionable aspect of the film is the degradation of Houlihan. After suffering through the embarrassment of having her affair with Burns broadcast on the public radio, her humiliation continues. Curious whether Houlihan is a natural blonde, Hawkeye and Duke arrange for her to be exposed while taking a shower in order to settle a bet. One could argue that every authority figure is humiliated, but none of the men were sexually degraded. Furthermore, Houlihan is the major female character, the other two are Blake’s mistress, and Lt. Maria “Dish” Schneider (Jo Ann Pflug), who sleeps with Hawkeye and solves Painless’ problem. Basically ornaments, neither woman actually expresses an original thought, unlike Houlihan, who has a well-developed, if unlikable, character. The fact that the nurses eagerly gather to watch the humiliation of their superior implies that she treated them horribly, but that mistreatment is never shown, she is just a scold, not a tyrant. In a bizarre turn of events, Houlihan later has an affair with Duke, even though he had organized her humiliation, and only then is she accepted by the rest of the community, which seems pretty misogynist. Admittedly, most of the misogynistic treatment of women was in both the novel and the script, and Lardner had introduced the shower scene, but he had limited the audience to the three doctors, and he had Houlihan leave the camp in shame. Altman decided to have the entire camp watch her humiliation and he even made her a cheerleader during the climatic football game, which is an unbelievable transformation. 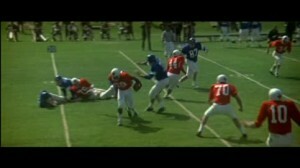 Despite its anti-conventional nature, the movie still ends with the most stereotypical convention imaginable, a football game, where the members of the community come together to battle another community. 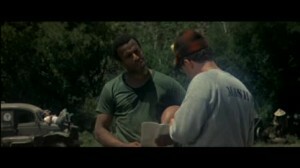 The only benefit of the football storyline was the film debut of Fred Williamson, who later became a star of blaxploitation films. The football game is boring unless you like football. 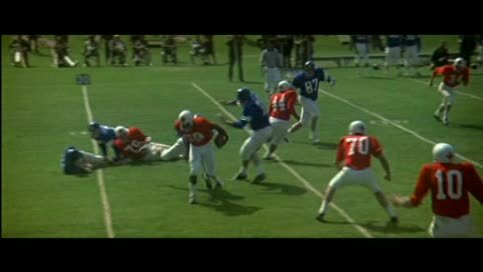 Originally a much shorter version in the screenplay, the football scene was expanded because Altman was a major football fan, especially since he had hired a number of professional players for the scenes. Zanuck and the rest of the senior staff at the studio did not laugh during the first screening, and they threatened to re-edit the film with all of the blood removed from the surgery scenes. After a great deal of screaming, producer Ingo Preminger convinced the studio to allow a preview in San Francisco, and the preview was a huge hit, so the film was released without any changes, and it was a giant success. The lyrics to the theme song were written by Mike Altman, the director’s fourteen-year-old son, who made more money from the rights to the theme song than Altman made from the movie. To be fair, it is an amazing theme song, and MASH is not an amazing movie. The theme song was only intended to be sung during the Last Supper scene, but Altman was so impressed that he decided to use it as the theme song. It was a brilliant decision. 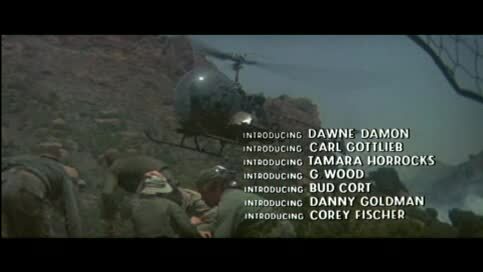 Having the song Suicide is Painless play over the opening credits warns the audience that this will not be a traditional war movie. Furious that the only Oscar won by the film was for the script, Altman started to criticize Lardner’s version and to pump up his own involvement, especially since he was not getting a percentage of the profits, having agreed reluctantly to accept a flat fee. Altman would later claim that he had completely rewritten the script but actually there were few differences between the script and the final film. One of the few changes made by Altman was the ending. The book and the original screenplay had ended with Hawkeye returning to his wife and kids in Maine, and his kid asks what the MASH written on the duffle bag meant. Instead, a friend of Altman suggested that the film conclude with an announcement that tonight’s film will be MASH with a roll call of the cast. There are few positive things that I can say about MASH, but I really got into the Japanese rock that played on the camp public address system. There is no denying that MASH was an important part of New Hollywood, but so was Bonnie and Clyde (1967), and I hate that movie. 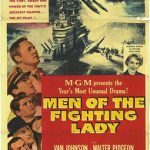 The movie contains a lot of humor, or is supposed to, but you don’t really care about the characters or learn anything about the Korean War. It may have been daring at the time, but now it is simply an annoying, homophobic, misogynist film where a football game is all that matters. I agree for the most part. It is definitely overrated and reminds me of “Good Morning, Vietnam” in that they both benefited a great deal from the timing of their release. I totally agree with your analysis of the Houlihan character arc. It is way too harsh on her and then for her to become one of the gang is not only unrealistic, but offensive. Part of the timing I referred to must have been that it was released before feminism really kicked in. The movie is lazy in its anti-authority theme. Houlihan is not worthy of the abuse and Burns is a ridiculous caricature, not to mention the mocking of religion. That is a very nice catch on the trio already being misfits when they arrived. I had not caught that. MASH, like the Odd Couple, is an example of a movie whose TV version was vastly superior to the overrated movie. It definitely tapped into something, but it came out when I was a kid, and I grew up on the tv show, so I had never watched the movie. It wasn’t a pleasant experience. Thanks for the comment about the trio of doctors already being misfits. that was the essence of the problem, there was no change in the characters caused by the grind of operating on young men damaged in a war that seemed to serve no purpose. are. The same goes for hierarchy. is actually the reunion of two generations which are pretty much alike. Thanks for the in-depth comment, I always appreciate people taking time to give feedback. However, I remain unconvinced. I have only seen a few of Altman’s more recent films, but even though it is his first ‘true” film, it was still an unpleasant viewing experience for me. You make a good point that the three surgeons basically imitate the bullying that they see everywhere in the army, but that approach simply deepens my dislike of the characters. 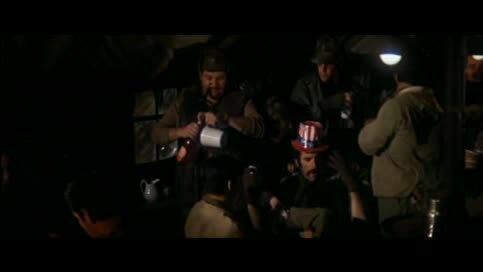 Using the film to criticize the deeply unpopular Vietnam War, Altman used the surgeons to show that the only rational response was to escape into booze and pranks, but there was no character arc, no progression to that emotional state. sorry that we disagree, but the film simply did not work for me. Although the director was against the Vietnam war, I don’t think the film is specifically anti-Vietnam war, or even anti-war in the usual sense. Obviously, it doesn’t fall in the line of ‘positive criticism’ (values against values), nor does it resort to the usual audience emotional response to ‘the horrors of war’. As Altman once said: “(…) people who need to see children burning to think something is antiwar (…) want a political statement, not an artistic one”. And you’re right about the absence of dramatic progression, except maybe towards more absurdity. MASH isn’t about awareness, it’s about repetition towards the worst – much like a slapstick comedy. It is a very pessimistic work, and I agree, the characters are dislikable – although, at the time and even today, they were seen as ‘cool’ by many. But the leads in McCabe and Mrs Miller or The Long Good-Bye are no ‘positive heroes’ either… The charge in Altman movies is broader than their particular context. It’s against a social organization seen as artificial and essentially cruel – which is certainly an extremely unpleasant thought. So, I also feel unpleasantness while watching MASH – the difference being perhaps that I choose to laugh about it. 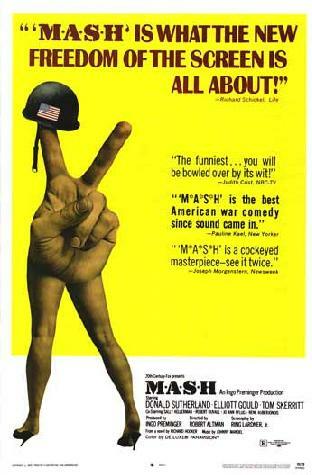 Since MASH was made in 1970, at the height of the protests against the Vietnam War, I don’t think that it is possible to remove the anti-vietnam war spirit from the movie, the anger against the war was simply too deep. 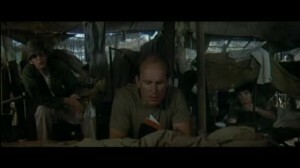 You are right that Altman does not show the horrors of war, but that is another reason why the doctors are so annoying. We do not see them being repelled by the horrors of war, so their behavior has no justification. As you point out, the doctors were seen as cool at the time, and even today, I am not denying the movie’s popularity. I simply do not find it funny or entertaining.In the end, humor is very subjective, and the film does not have that effect on me. My dislike is simply a gut reaction, but again, I am aware that my reaction is not common. dead than gay” part. Watching it has been a really painful experience.